The 30th Psalm is one which could have been written specifically for the circumstances which surrounded the Jews during the time of Esther. Though it was written by David many centuries earlier, it fits their situation so very well. Other than the several references to the Lord, which are lacking in Esther, the contents reflect going from hopelessness to joy and from utter defeat, to triumph. And then again, the words reflect the life and times of Joseph, David himself, and of course, Jesus. Yes, David may have been writing about his own terrible plight, but there is no doubt he was prophesying about events in the life of the Lord. All I can say is, “Thank God for Jesus.” He has taken away the prospect of such a terror for us. This doesn’t mean that we won’t face our own horror. A million and a half Armenians were destroyed by the Turks in the early 1900s. Countless other Christians have faced the same end at the hands of their foes, but unlike those who don’t know Christ, that isn’t the end for us. It is simply a step into a new beginning. The terror of dying for humanity is that of an end, followed by eternal separation. There is no hope, no second chance, and only eternity to contemplate what was lost. Again, thank God for Christ Jesus. In Him there is hope, and there is a new beginning. Someday the whole world will find that out. For now, there are temporary victories leading to that final great Day when the knowledge of the Lord will cover the earth as the waters cover the oceans. It’s all heading there, and it is all to be found in His superior word. And so let’s turn to that precious word once again and… May God speak to us through His word today and may His glorious name ever be praised. Today we begin our verses with the word, “But.” This then is showing us a contrast to the verse which we ended on in the last sermon. There it said, “This was on the thirteenth day of the month of Adar. And on the fourteenth of the month they rested and made it a day of feasting and gladness.” Those Jews who defended themselves from their enemies, and who lived in the provinces, had fought on the thirteenth of the month, and they rested on the fourteenth of the month. 18 (con’t) and on the fifteenth of the month they rested, and made it a day of feasting and gladness. The word “dwelt” should be in the present tense, “dwell.” It is speaking of the custom which arose out of the events described. Two rather rare, but almost identical, words are used here. The first is perazi, or “villages.” It is used only three times in the Bible, this being the last. The second is perazah, or “unwalled towns.” It also being used only three times, this being the first. 19 (con’t) with gladness and feasting, as a holiday, and for sending presents to one another. The mourning had turned to joy, the weeping and wailing had turned into banqueting, and the sackcloth and ashes were replaced with the sending of gifts of food to one another. This then is similar to the response found in Revelation 11:10 after the killing of the two witnesses, where it says, “And those who dwell on the earth will rejoice over them, make merry, and send gifts to one another, because these two prophets tormented those who dwell on the earth.” This remains the custom of those in the middle east today and it will, as you see, continue on in the end times. The reason for this seems clear. The Jews in the provinces fought on one day and celebrated the next. On the other hand, the Jews in Shushan fought on two days and celebrated on the third. In order to bring conformity to annual celebrations of this day, Mordecai establishes two days of celebration. It seems, based on this, that the “these things” of the previous verse were the details of what had occurred. They are thus presented as justification to all who were unaware of the events in Shushan for holding a two-day festival. It is not the days of fighting which are celebrated, but the days of resting. The Jews in the country rested on the 14th, and the Jews in Shushan rested on the 15th. These days of rest are combined into one celebration. It is a pattern set at creation. God labored and then rested, thus He sanctified the seventh day. Later, for Israel, the Sabbath was instituted as a day of rest in commemoration of that (Exodus 20:11). But it was also instituted as a day of rest based on their deliverance from Egypt (Deuteronomy 5:15). The celebration of Purim follows both patterns, rest after labors, and rest after deliverance. Again, we see in these words the stark contrast between the mourning and wailing in sackcloth and ashes of the initial announcement by Haman, and the joy and celebration of what finally occurred. God took that which was evil, and turned it around for good. 22 (con’t) that they should make them days of feasting and joy, of sending presents to one another and gifts to the poor. The intent of Mordecai’s letter was to establish a remembrance of what occurred. In order to solidify that, the days were to become special days, with more than just a memory of what happened, but an active participation in the day. Thus, each year, the people would come to anxiously anticipate the celebration. And so, the commemoration each year was to follow what occurred on the first occasion – feasting, joy, and sending portions of food. And one extra expectation is given, that of sending gifts to the poor. The obvious reason for this addition is that all Jews were delivered, and thus all Jews, even the poor, should be able to participate in, and celebrate, what occurred. Here, the entire title of Haman is given. He is the son of Hammedatha the Agagite, and he is the enemy of the Jews. It is also the last time that he will be mentioned in the Bible. In a short recap, we are reminded that it is he who had plotted against the Jews in order to annihilate them, but instead, it is he who saw annihilation. 25 but when Esther came before the king, he commanded by letter that this wicked plot which Haman had devised against the Jews should return on his own head, and that he and his sons should be hanged on the gallows. The name Esther is inserted here, and it seems out of place to do this. It is more likely speaking of the matter itself – “And when the matter was brought before the king.” Once the truth was brought to his attention, the action necessary to rectify the situation was commanded. Interestingly, and in accord with using the word hamam in the previous verse, it doesn’t give the details about the deliverance of the Jews, but instead, it deals with the plot itself and how it was turned back on Haman and his sons. One can infer divine retribution is the intent of the words here. A celebration of the foe’s defeat! 26 So they called these days Purim, after the name Pur. Verse 26, leading into verse 27, introduces our final set of two’s in the book. It is the two letters instituting the commemoration of Purim. The first is here, written by Mordecai. The second is written by Esther & Mordecai in verse 29. They contrast, and yet they confirm the instructions for the observance of the celebration at their appointed time, year by year, and wherever the Jews were. 28 that these days should be remembered and kept throughout every generation, every family, every province, and every city, that these days of Purim should not fail to be observed among the Jews, and that the memory of them should not perish among their descendants. An obvious question arises from the establishment of Purim. “Is it of divine origin, or is it of human origin?” The story is given in the book of Esther, a book of the Bible, but the imposition of the celebration came from a Jew and not only a Jew, but one of the dispersion. It seems hardly likely that the Jews in Israel would feel the need to add something to their culture and life that came from someone who wasn’t a prophet or a priest. But it was accepted. As Mordecai was second to the king, and as the land of Israel was subject to the laws of Persia, and as there was nothing but good which had come from the matter, it was accepted as Mordecai had written. Thus, it was of human origin. However, it is as clear as it can be that the Lord had directed the events – from beginning to end – in order to bring about the Jew’s deliverance. Therefore, it is implicitly of divine origin, and certainly divinely sanctioned. And this is all the more relevant because it is notable that Nisan is the first month of the year in Israel’s redemptive calendar. The last month is Adar. In both months, the 14th and 15th of the month are considered special days. Nisan 14 is the Passover, and the 15th is the first day of Unleavened Bread. Adar 14th and 15th are now made special commemorations. The first recognized Israel’s redemption from Egypt. The second recognizes deliverance from the enemies of God’s people. The redemptive year thus opens and closes in recognition of the Lord’s hand in the preservation of His people. Finally, as the proverbs showed us, the Lord directs the lot. Therefore, the days are not accidental, but purposeful. The unseen hand of the Lord guided the events which led to a national proclamation that the days of Purim would not cease. Therefore, wherever a Jew is, and throughout his generations, the day is to be remembered as a day of deliverance. 29 Then Queen Esther, the daughter of Abihail, with Mordecai the Jew, wrote with full authority to confirm this second letter about Purim. And then it says that they have kal toqeph or “full power.” The word toqeph is new here. It will be seen twice in Esther, and once in Daniel. They are granted the full power, or authority, to confirm a second letter about Purim. The word “letter” here is the same as in verse 26, iggereth. This is the last time it is used in the Bible. The words of the verse are widely translated, and scholars debate over what the true meaning is of what is being relayed. But because of the use of this word, iggereth, it appears that the first letter is that of Mordecai in verse 26, and now a second letter is being issued by Esther, along with Mordecai. This then closes out our final set of two’s in the book – the two letters instituting the commemoration of Purim. The first was in verses 26 & 27, written by Mordecai. The second is here, written by Esther and Mordecai. They contrast, and yet they confirm the instructions for the observance of the celebration at their appointed time, year by year, and wherever the Jews find themselves. 5. The entire word EMET is symmetrical in the alphabet. 6. God – Blood – Cross. 8. He was, He is, He will be. The three verbs, “confirm,” “prescribe,” and “decree,” are all from the same Hebrew word. 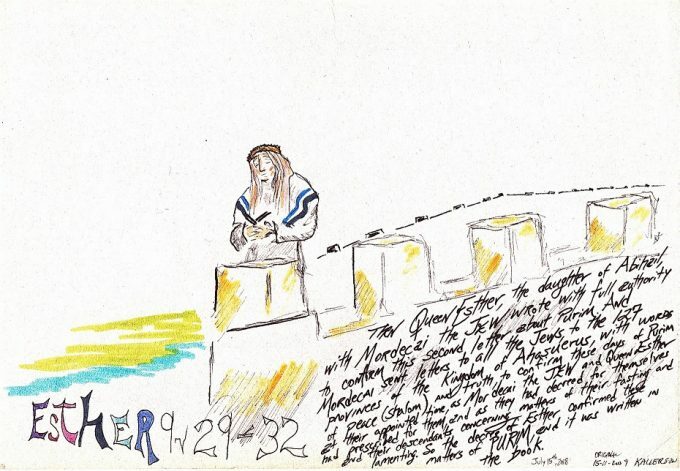 The word means “to stand,” and thus it signifies “fixing,” or “establishing.” The letters of Mordecai confirmed what was prescribed by both himself and Esther concerning the days of Purim – when it should be held, how it should be observed, and so on. 31 (con’t) concerning matters of their fasting and lamenting. These words completely dumbfound scholars. First, the word fasting is plural. It should say, “fastings.” Some claim the words are a later insertion, some claim they are speaking of fasting and mourning on the thirteenth of the month, known as “Esther’s Fast.” Others just ignore any context and ramble on about the state of Esther and Mordecai when they first got the bad news about the annihilation of the Jews, and how that should be continued on by the Jews in the future. The Jews already had customary times of fastings and lamenting, as during their time of exile. They are not biblically mandated, but were customary times of mourning, just as “Holocaust Remembrance Day” is observed today in Israel. The days of Purim are now being tied in with those times of fastings and lamenting as customs to be observed by the Jews. Unlike those, however, Purim was always to be observed, and by all people. *32 So the decree of Esther confirmed these matters of Purim, and it was written in the book. Esther was given authority to confirm the matters of Purim, something pertaining only to the Jews, by a command. After that was accomplished, the details were written ba’sepher, or in the book. The question is, “What book?” Some say it is the book of Esther, but that is not a natural way for a Hebrew author to refer to a book he is writing in. Others think it might be a book used as a basis for the book of Esther which has not been preserved. But what is probably correct is that it is speaking of the Book of the Chronicles of the Kings of Persia and Media. It has already been described this way four times in Esther, and there is no reason to assume that it isn’t the same here. As a point of note, the maamar, or decree, of Esther is the same word as was used concerning King Ahasuerus towards Vashti in verse 1:15. It is a command. This is its third and last use in the Bible. And as a curious finishing note to the verse and the Chapter, Catholic Bibles, such as the Latin Vulgate and the Douay-Rheims, translate this verse in the most odd manner. They say, “And all things which are contained in the history of this book, which is called Esther.” That is so far from the Hebrew that it had to be intentional. It may be that because the word maamar, or command, is coming from a woman, they intentionally changed the wording so that it could not conflict with later instructions in the Bible about women not having authority over men. If that is the case, as I suspect, that is a terribly stupid reason for changing the word of God. Deborah was a Judge of Israel; and despite the circumstances, there was one ruling queen, Athaliah, in Jerusalem for a while. She eventually got whacked and things got back on the right path, but the Bible is a record of what occurred, and what was said, regardless of the propriety of the situation. Translations of the Bible need to reflect what is said, not what one desires for it to say. We now have one chapter, of three verses, left to go. What will come out in that sermon was still yet unknown at my time of typing this sermon. Like Jonah, I hadn’t got my mind made up in advance, and I can only present to you what the Lord will reveal as I contemplate what has been presented in these past nine chapters. For now, what I can tell you, is that I hope you are much better informed on the book than when we started. If nothing else, we have reviewed every verse and every sentence with a view to the hidden Lord who is still clearly evident in its pages. He is, after all, the main Subject of all of Scripture. What we need to do now, and at all times as we read the word, is to think on Him, on His plan of redemption, and on what lies ahead for Israel as a people, and for us as a body, in that plan. With these things in mind, the Lord will continue to open our minds and reveal Himself to us. As we have seen since Chapter 1, His attention is on what is happening, He is there – directing the events, and what seems clearly hopeless, is actually a chance for the Lord to shine through all the more at the end. Imagine the pain of the those who walked with Christ as they saw Him crucified. The darkness which must have covered their hearts would have been unimaginable. And yet, despite the greatest moment of pitch black they had ever encountered, there shown forth the most resplendent light they could ever have imagined. This is what we too need to focus on as we hit those black, dark moments in our own lives. Children may be as lost as the prodigal son, marriages may be torn and destroyed, finances may be completely used up, but these things can never cover the light which lies ahead for the redeemed of the Lord. Israel went from sackcloth and ashes to feasting and joy. So too will we at the end of this difficult road, if we just profess faith in Christ. He’s already gone before us to open the doors and prepare the table. Let us follow Him until we pass through and sit down to dine, rejoicing in His marvelous presence for countless ages to come. The Lord has you exactly where He wants you. He has a good plan and purpose for you. At times, you might feel as if he has no great design for you in life, but he has brought you to this moment to reveal His glory in and through you. So follow Him and trust Him and He will do marvelous things for you and through you.